A couple of the lovely ladies who hook up for Book Club Fridays have reviewed books by Sophie Kinsella’s alter-writer-ego, Madeleine Wickham, so when I saw one at my local Costco, I picked it up. Truth be told, there were a few but this one caught my eye because I love to play tennis! And I love parties! Needless to say, I was pretty psyched to get started on The Tennis Party. The story takes place at Patrick and Caroline’s country-ish mansion, over a weekend that was supposed to be centered around a tennis tournament. At first, I fell in love with the idea of collecting my friends for a two-day round-robin of my favourite sport but soon, things started to fall apart like a bad weave. I won’t get into the intricacies of how all of the characters know each other because that would be a little spoiler-y but I will say that there were some unclear connections. Well, maybe not unclear but certainly unconvincing. Like everything was just a little too convenient to be happening, you know? 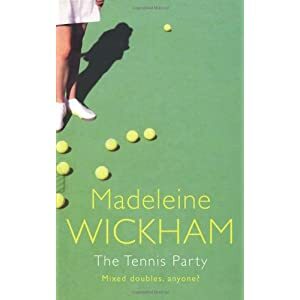 The Tennis Party is a relatively short novel – a little over 300 pages. And, as such, there isn’t a ton of room for character development. Let alone room to flush out all eight, and this is the novel's primary problem. The plot moves at a fairly quick pace and goes off in about a thousand different directions, which would have made for a great read if I gave a gosh-darn about the characters. Which I didn't. Boo. There was a little bit of tension but it was drawn out to such an extent that it became more annoying than enticing. Then, when the big reveal finally happened – I didn’t get it! To be fair, it was a very England-specific reference but even Google couldn’t really explain it. So, the big climax of the plot was pretty much lost on me. The only parts of the book that I really liked were the children. There were some very touching scenes and whenever the book changed to one of their POVs, I was sucked back in. I think it’s safe to say that if the children hadn’t been present, I wouldn’t have finished the book. So, in sum, I’m VERY SAD that I didn’t dig The Tennis Party. Mostly because it means my relationship with Sophie Kinsella is officially over. However, Ms. Kinsella's Shopoholic books shall remain in my glass-doored bookcases because they’re awesome and I’ll love them forever. Such a bummer that there won’t be more of those because I really miss Rebecca Bloomwood/Brandon and all of her quirky hilarity. Aah it’s so disappointing when a book doesn’t deliver. Hope the next book you read is brilliant! What a shame! I love Sophie Kinsella/Madeleine Wickham novels, though I'll probably skip this one. Happy Friday! i ADORE sophie kinsella's books but i do NOT like any of her real-name madeleine wickham's novels lol. i didn't even know she wrote a new one but it sounds like i will be avoiding it. I really love sophie kinsella and I've tried to read a few of the madeline wicham novels but i just didn't get into them like I do for the sophie kinsella ones. I cannot get into anything by Madeline Wickham, but I love Sophie Kinsella. It is SO WEIRD, but at the same time so fascinating that an author can have two such different writing styles! I reviewed I've Got Your Number for book club this week and I really liked it! I have read one Madeline Wickman book, which I did enjoy, but not as much as all her Kinsella books. What's funny though is that I thought I had seen or at least heard about all of her books, but this one is one I've never seen before. Maybe it's a new one? Or maybe I'm not as book obsessed as I thought. Ha! I'm not as big of a fan of she books she's written as MW than SK.